Review: A Southerner girl who was brought up right and went against the odds to fulfill her dream is what describes Condoleezza Rice: A Memoir of My Extraordinary, Ordinary Family and Me. It is two hundred and ninety three pages, which are the actual story pages, and there are twenty-six more pages on the glossary and chronology of events. Plus, towards the middle of the book there are photographs of Condoleezza and her family, some dating back to slavery in the south, and others going to as recent as 1992. Condoleezza has pictures of different artifacts that are mentioned in her book, and gives many detailed facts about each picture. Condoleezza Rice: A Memoir of My Extraordinary, Ordinary Family and Me is basically all about the "extraordinary, ordinary family" and Ms. Rice. It begins with the story of Condoleezza's ancestors who were slaves in the south, going as far back to her paternal great-grandfather and great-grandmother, her great-grandmother being a favored household slave who learned to read and write. It then chronicles her parent's lives and eventually her growing up in the horrors of segregation, instead of bringing her down, this fires her up, and she tries as hard as she can to make people feel equal, or at least make people of her own race feel better about themselves. This is what has kept Condoleezza going for her whole career. It's what got her into the piano, ice-skating, going to college at the age of sixteen, attending the University of Denver, then going on as a provost at Stanford University after going to the University of Notre Dame for graduate school. Ms. Rice kept going even farther to achieve, which got her to one of her biggest successes, becoming the Secretary of State. 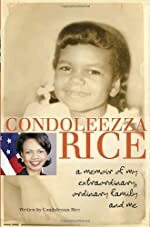 Condoleezza Rice: A Memoir of My Extraordinary, Ordinary Family and Me is an inspiring account of the ups and downs in the life of Condoleezza Rice. Ms. Rice did a wonderful job on telling her readers all about her family and her life. As I read the book, I too felt as if I were a member of the Rice family, because she shared with me every single detail of her whole life. It was as if she had started writing the book when she was two years old, and continued up until 2010! I found myself crying when Ms. Rice's father and mother passed away, and at the reasons why they had had such a hard life. By the sacrifices they made for their one and only daughter, whether it be through money problems, or family problems, or any problems at all, Mr. and Mrs. Rice would do whatever it took to make their daughter have the best future any African-American could have before and after segregation. Condoleezza was such a good author in this book; I can't wait to read another book by her! An inspiring detail that I thought was positively genius to put inside the book was the naming process of Condoleezza. Mrs. Rice didn't want her daughter to have a name that any other child could possess, she wanted it to be special. Mrs. Rice could tell her daughter was special from the moment she was born, which is why she picked the name "Condoleezza", meaning "with sweetness". One time when Condoleezza graduated high school, the school spelled her name wrong, so Mrs. Rice sent the certificate straight back so they would spell Condoleezza with two z's and not one. I found all of Ms. Rice's family tales and adventures very amusing and informing. I feel like I have one more family, or at least I know everything there is to know about this family. Nobody can quite make you be in his or her family, but they can make you feel like you're just like family. That is exactly what I felt this book made me feel like throughout every chapter, every page, and every word. Review written by Amber (6th grade student). We would like to thank Random House for providing a copy of Condoleezza Rice: A Memoir of My Extraordinary, Ordinary Family and Me for this review. Have you read Condoleezza Rice: A Memoir of My Extraordinary, Ordinary Family and Me? How would you rate it?